If you want to buy good wine, Elizabeth Wolkovich says, you’re going to want to stop looking at labels and just listen to your taste buds. An assistant professor of organismic and evolutionary biology, Wolkovich is a co-author of a new study that suggests that, although vineyards may be able to counteract some of the effects of climate change by planting lesser-known grape varieties, scientists and vintners need to better understand the wide diversity of grapes and their adaptions to different climates. The study is described in a Jan. 2 paper in Nature Climate Change. “It’s going to be very hard, given the amount of warming we’ve already committed to … for many regions to continue growing the exact varieties they’ve grown in the past,” Wolkovich said. “But what we’re interested in talking about is how much more diversity of grape varieties do we have, and could we potentially be using that diversity to adapt to climate change? 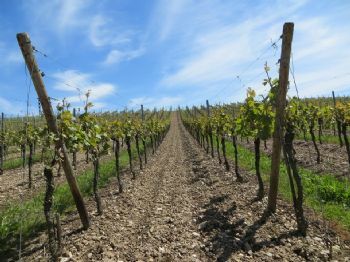 Unfortunately, Wolkovich said, convincing wine producers to try different grape varieties is difficult, and the reason often comes down to the current concept of terroir. Terroir is the notion that a wine’s flavor is a reflection of which, where, and how grapes were grown. Thus, as currently understood, only certain traditional or existing varieties are part of each terroir, leaving little room for change. But even if that appetite existed, Wolkovich said, researchers don’t yet have enough data to say whether other varieties would be able to adapt to climate change. But even if researchers came to the table armed with information about grape diversity, Wolkovich said the industry — both in the traditional wine centers of Europe and around the world — still faces hurdles when it comes to adapting. In Europe, she said, growers have the advantage of tremendous diversity. They have a wide variety of grapes to choose from, research repositories such as INRA’s Domaine de Vassal that study this diversity, and expertise in how to grow the varieties. Yet strict labeling laws have created restrictions on their ability to take advantage of this diversity. For example, just three varieties of grapes can be labeled Champagne, or four Burgundy. Similar restrictions have been enacted in many European regions, forcing growers to focus on a handful of varieties. New World winegrowers, meanwhile, must grapple with the opposite problem: While there are few, if any, restrictions on which varieties may be grown in a given region, growers have little experience with the diverse — and potentially more adaptable — varieties found in Europe. Just 12 varieties account for more than 80 percent of the grapes grown in Australian vineyards, Wolkovich said. More than 75 percent of all the grapes grown in China are Cabernet Sauvignon. The chief reason for that has to do with consumers. “They have all the freedom in the world to import new varieties and think about how to make great wines from a grape variety you’ve never heard of, but they’re not doing it because the consumer hasn’t heard of it,” Wolkovich said. As Wolkovich sees it, wine producers now face a choice: proactively experiment with new varieties, or risk suffering from climate change.